In 2018, wholesale electricity markets were a bumpy ride for the advanced energy industry. The year began with major victories for the sector, including the Federal Energy Regulatory Commission’s (FERC) unanimous rejection of the Trump Administration’s proposal to bail out uneconomic coal and nuclear power plants, and FERC’s adoption of a final rule (Order 841) opening wholesale electricity markets to energy storage resources. But headwinds developed as the year went on, including FERC’s June order requiring PJM to make major changes to its capacity market that could result in new barriers to participation for advanced energy resources, and moves in PJM and ISO New England to favor so-called “fuel secure” resources. After a turbulent 2018, what will 2019 bring? Here are some of the key areas where AEE will be engaged to ensure that advanced energy resources can continue to achieve growth in wholesale electricity markets. As 2018 drew to a close, the six FERC-jurisdictional Regional Transmission Organizations and Independent System Operators (RTOs/ISOs) filed their plans to comply with FERC Order 841. That final rule, enthusiastically supported by AEE, requires RTOs/ISOs to develop “participation models” consisting of market rules that allow energy storage resources to provide all the capacity, energy, and ancillary services they are technically capable of providing. This directive from FERC sets the stage for an estimated 50 GW boost in energy storage development in the next decade. In response to Order 841, the RTOs/ISOs filed extensive revisions to their market rules. While those proposed revisions will go a long way to realizing the wholesale market value of energy storage, AEE has identified some areas where RTO/ISO compliance is in danger of falling short. Many of the RTOs/ISOs do not clearly lay out how their proposals ensure that energy storage resources located on the distribution grid or behind-the-meter at a customer site, but are capable of providing wholesale services, will be permitted to do so. Similarly, not all compliance proposals sufficiently address the fact that energy storage resources are uniquely capable of providing both retail and wholesale services, which is key to developing energy storage projects and ensuring that customers receive the full value of them. Finally, in certain instances the RTO/ISO proposals either leave in place legacy barriers to the participation of energy storage resources or create new ones, including qualification criteria and requirements for sustained duration that either prevent market participation or severely limit market value. AEE is now preparing comments, due February 7, to flag these and other issues for FERC’s consideration. When it first proposed what became Order 841, FERC simultaneously proposed regulations that would require RTOs/ISOs to similarly open their markets to participation by aggregations of distributed energy resources (DER). When it issued Order No. 841, FERC chose not to finalize its aggregated DER proposal, instead establishing a two-day technical conference, held in April 2018, to gather additional data and information. AEE and numerous AEE members testified during the technical conference and submitted post-conference comments showing how DER can improve reliability and resilience by giving wholesale market operators access to these resources to resolve unanticipated events on the grid and visibility into their operations. Utilizing this expanding set of customer-based resources to meet wholesale grid needs will also benefit customers by improving their utilization and avoiding investment in other resources. FERC is now poised to issue a final rule early this year. 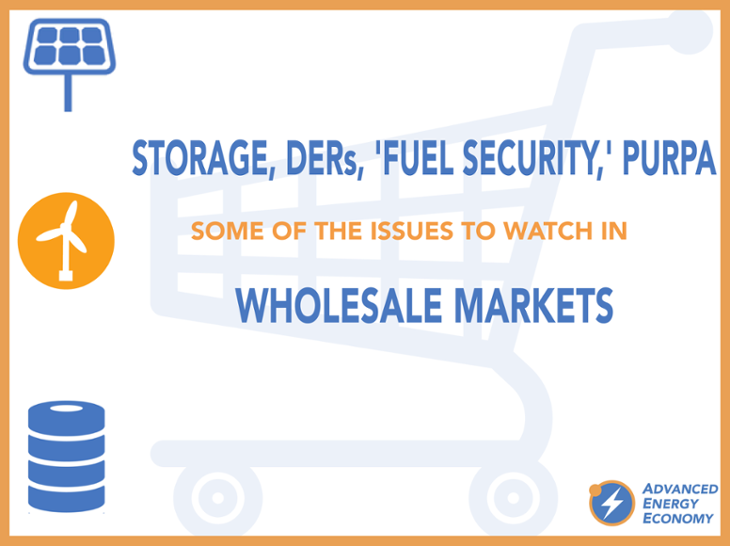 AEE has advocated for a final rule that allows aggregated DERs to provide all the wholesale services they are technically capable of providing. In addition, we pushed back on proposals that FERC adopt extensive “opt out” provisions that would allow states and utilities to broadly ban wholesale market participation by aggregated DERs in their area. To be sure, states and utilities have a critical role in ensuring the reliable development and operation of DERs, and federal and state authority in this area should be harmonized to ensure that customers and the grid broadly share the reliability and cost benefits of DER operations. AEE has argued that an extensive opt-out is not necessary to preserve the appropriate role of states and utilities, and would unnecessarily restrict competition and result in unjust and unreasonable rates. Grid Resilience and “Fuel Security” – Opportunity or Bailout? Despite FERC’s unanimous conclusion in early 2018 that the retirement of aging, uneconomic coal and nuclear plants does not pose risks to the bulk power system, the debate over whether out-of-market interventions or market rules targeted to support these legacy technologies are needed to ensure that the grid can withstand events such as severe weather and disruption of fuel supplies continued throughout the year – and will likely do so this year as well. Following its rejection of the bailout proposal, FERC launched its own inquiry into the resilience of the bulk power system. Then a draft memorandum leaked from the Department of Energy revealed a plan to declare an “emergency” and require that many coal plants receive out-of-market compensation to forestall their retirement, an idea that could cost consumers as much as $34 billion if implemented. In addition, both the North American Electric Reliability Corp. (NERC) and PJM released studies assessing the reliability and resilience impacts of extreme (and largely implausible) power plant retirement, weather, and fuel supply scenarios. Finally, as 2018 came to a close, FERC issued the latest in a series of orders in ISO New England that provide a natural gas power plant and an associated liquified natural gas facility with full out-of-market cost support based on claims that failing to do so would threaten fuel supply and reliability in the region. Both NERC and PJM have made clear that their reports are extreme “stress tests” that are not predictive of future reliably and resilience problems. Nonetheless, PJM plans to initiate a stakeholder process to consider whether market reforms are needed to value the fuel attributes of particular resources and ensure the so-called “fuel security” of its system. ISO-NE will similarly undergo stakeholder processes this year to consider changes to its markets to address fuel security risks that FERC’s recent orders purport to identify in the region. For its part, NERC is beginning discussions of whether new “fuel assurance” reliability standards are necessary. These activities, along with FERC’s still-pending resilience inquiry, could result in new out-of-market actions or discriminatory market rules that seek to bail out financially struggling coal and nuclear power plants, at the expense of opportunities for advanced energy growth. AEE has emphasized that no reliability or resilience threats to the grid have been identified, including in the recent NERC and PJM reports and the responses of the RTOs to FERC’s resilience inquiry. Moreover, AEE has advocated that any studies of resilience or fuel security risks, and any measures taken to address identified risks, must be technology neutral and take into account the ability of a wide range of advanced energy technologies to provide solutions. Rather than design technology-specific solutions (such as market mechanisms focused on the “fuel attributes” of resources), grid operators should design technology-neutral services needed by the grid and allow all resources to provide them. This would improve the resilience and reliability of the grid while providing advanced energy technologies – which are uniquely situated to provide resilience benefits, such as responding quickly to grid disruptions and reducing reliance on delivered fuels – a significant new market opportunity. AEE will continue to push for these market-oriented and technology-neutral solutions to the needs of the grid that allow our technologies to compete on price and performance, and don’t use out-of-market command and control measures to lock in old polluting technologies. AEE has led a broad coalition of industry groups, buyers of renewable energy, and other key sectors in objecting to these proposals. We submitted evidence showing that RPS programs – and the renewable energy certificates (RECs) used to support them and also to meet voluntary clean energy goals – do not adversely impact capacity market prices. In addition, the Advanced Energy Buyers Group led the charge for large corporate and institutional buyers of clean energy, urging FERC to ensure that, at a minimum, the proposed changes not apply to the voluntary transactions they engage in, which would chill a rapidly expanding market in the PJM region. FERC is expected to act on these proposals early this year. Former Commissioner Robert Powelson was the deciding vote in the 3-2 decision last year that initiated these proceedings. Commissioner Powelson has since departed, leaving the Commission deadlocked 2-2 between Democratic and Republican appointees after the passing of Commissioner McIntyre, making the path forward unclear. Reforming PURPA – But How? Finally, FERC is expected to consider reforms to its implementation of the Public Utility Regulatory Policies Act (PURPA). This landmark law, passed by Congress in 1978 and amended in 2005, paved the way for the development of renewable energy, and competitive electricity markets, by requiring monopoly utilities to purchase the output of clean generation resources (called “qualifying facilities”) owned by non-utilities. The utilities must purchase this output at their “avoided cost” – that is, the cost they would have incurred to generate the power themselves – which is set by state regulators. Utilities, state regulators, and renewable energy companies have all called for various reforms to PURPA and its implementing regulations. Utilities that are subject to PURPA’s requirement to purchase the output of qualifying facilities have asserted that the development of RTOs/ISOs and competitive wholesale markets, and cost declines in renewable generation technologies, make this mandate outdated. Renewable energy developers, meanwhile, argue that aspects of PURPA (including the obligation to purchase and the avoided cost rate) have yet to be fully implemented by many states, and that the mandatory purchase obligation is still necessary in many regions, particularly for small renewable energy projects that face barriers to entry in wholesale markets. FERC Chairman Neil Chatterjee has made reform of FERC’s PURPA regulations a priority. AEE will be engaged to ensure that PURPA reform efforts are informed by a full picture of current opportunities and barriers facing non-utility renewables and other advanced energy sources. While wind, solar, and other advanced energy technologies have made impressive gains and cost declines in the market, PURPA still has a place in opening wholesale markets to their participation and overcoming barriers to entry in legacy rules and market structures.